In our vernacular, “mass” and “weight” are terms that are often seamlessly interchanged, but technically, they are anything but twins. In scientific terminology, “weight” and “mass” represent distinct and rigid definitions. So… what’s the difference? “Mass” is defined as the amount of matter that an object contains. 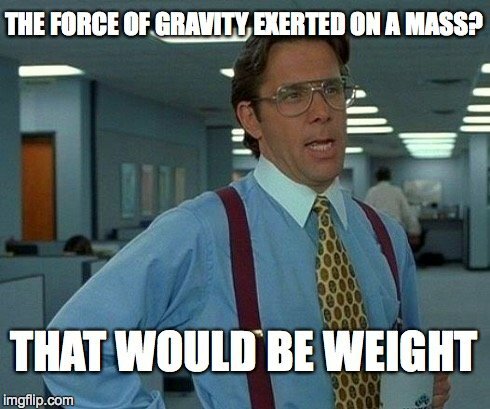 While “weight” represents the force that a mass-containing body exerts on another body purely under the influence of gravity. Mass is impervious to the forces of gravity, weight is the embodiment of this force itself. Mass is defined as the amount of matter that an object contains. However, due to the ambiguity surrounding the definition of matter itself, this definition greets a lot of criticism. A more concise and accepted way of defining mass is to define it in terms of inertia. 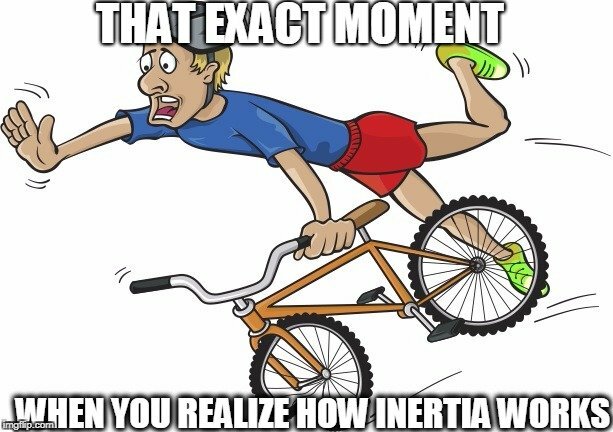 The inertia of an object can be defined as its resistance to being accelerated or moved when prodded by an external force or continuing to be in a state of motion unless its motion is hindered by another external force. The higher the mass, the more difficult it is to displace or stop matter in its tracks — larger rocks are not only harder to push or lift, but also require more firepower to contain their motion than smaller, lighter rocks. The standard unit of mass is Kilograms (Kg). One peculiar characteristic of mass is that it is constant, regardless of its position in space. The law of gravity tells us that two objects are attracted towards each other with a force proportional to the product of their masses. However, the force itself has no effect on the magnitude of their mass. A 60 Kg block on Earth will also be 60 Kg on Mars, Saturn or any remote corner of our indifferent Universe. 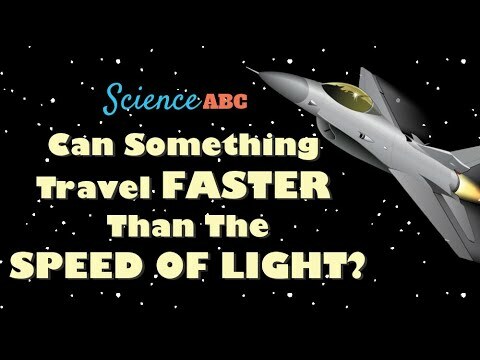 Of course, I haven’t considered the effects of special relativity, where mass tends to increase due to an addition of excess matter or energy when it moves at relativistic velocities or speeds close to the speed of light. Boring into those depths would be beyond the scope of this article. Conventional wisdom suggests that the weight of an object indicates how heavy it is. This is why we often witness mass and weight being synonymously used in general or daily accounts. However, technically, weight represents the force that a mass-containing body exerts on another body purely under the influence of gravity. Whereas mass is impervious to the forces of gravity, weight is the embodiment of this force itself. 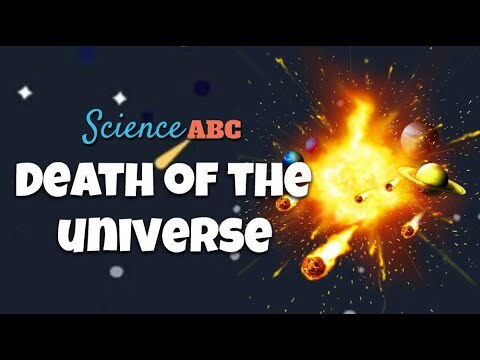 It is the magnitude of gravitational force by which an object is pulled towards another. 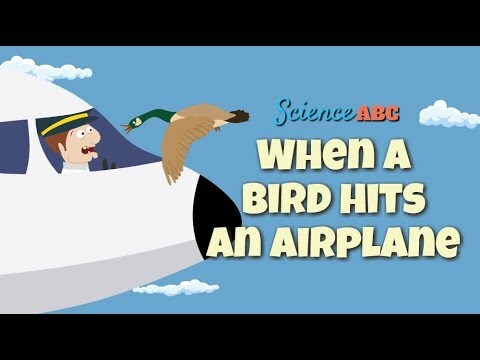 Because weight is a force, its unit of measurement is the standard unit of force: Newton (N). For a better perspective, weight is the force that our mass exerts on Earth. 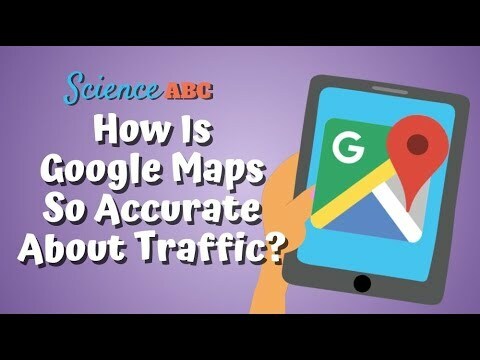 The above result reduces the law of gravity to Newton’s second law of motion: F = ma. 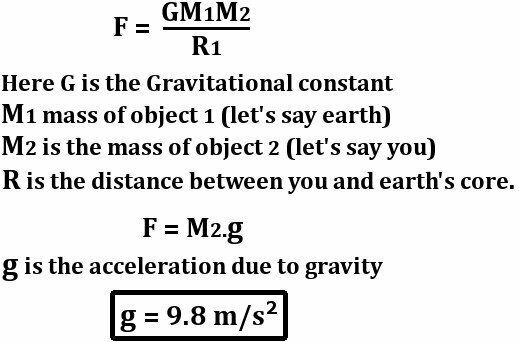 Every object of mass m constantly falls towards Earth at an acceleration g. It denotes the acceleration due to Earth’s gravity; that magnitude is 9.8 meters per second squared. The magnitude of acceleration is different for different celestial bodies, as it depends upon the mass of the body in question. For instance, the moon’s acceleration due to gravity is 1.620 meters per second square. 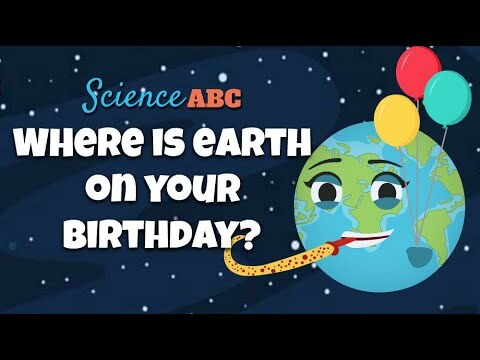 This is why objects weigh 1/6th of what they weigh on Earth. Thus, an astronaut with mass of mass 90 Kg weighs 90 x 9.8 = 882 Newton on Earth, but he or she weighs 90 x 1.620 = 145.8 Newton on the moon. 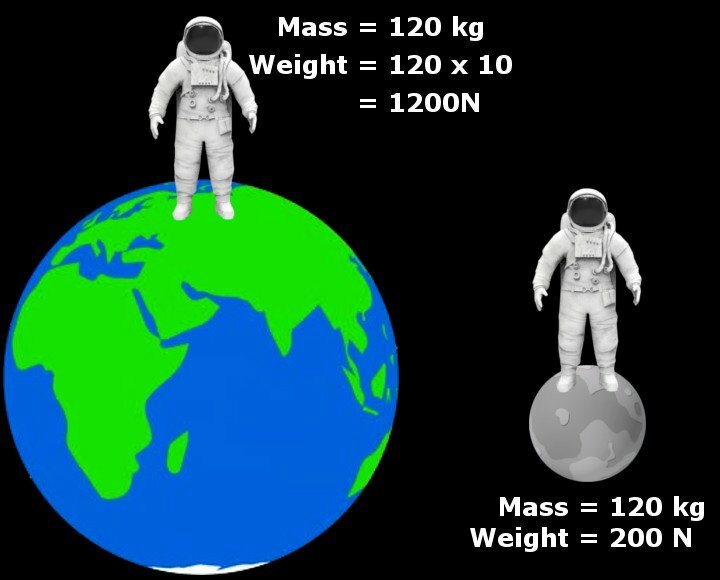 Similarly, the weight of an object will be much larger if it rests on a heavier body, such as Jupiter or Saturn. Note that the astronaut’s mass remains the same throughout this strange experiment (i.e., 90 Kilograms). However, the apparatus he carries, a weighing machine, wouldn’t agree. 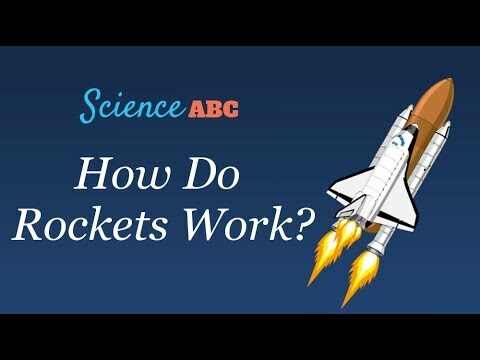 It would produce highly inaccurate results on the moon… but why? How do we obtain mass from weight? Weighing machines are instruments that measure the mass of an object by measuring the equal and opposite force that the Earth exerts on us in response to the force we exert on it as we stand on its surface. In science jargon, this force is termed the Normal force. Weighing machines measure the normal force generated by Earth, but they are calibrated in such a way that they divide this force by 9.8 and give an approximation of our mass (m= F/g). Therefore, carrying a weighing scale calibrated to the gravity of Earth will produce erroneous results on say, Mars or the moon. This mechanism also renders them useless in free fall or space, as the free fall forces the weighing scale to fall at the same rate as we do; there is no normal force produced and the needle remains unmoved. 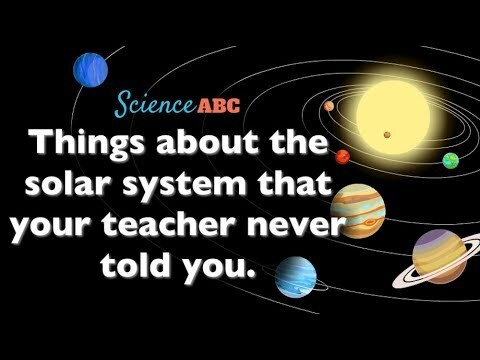 Similarly, floating in space without any surface below it causes the needle to stand callous and erect under the digit zero. Another instrument that can measure mass is the beam balance. 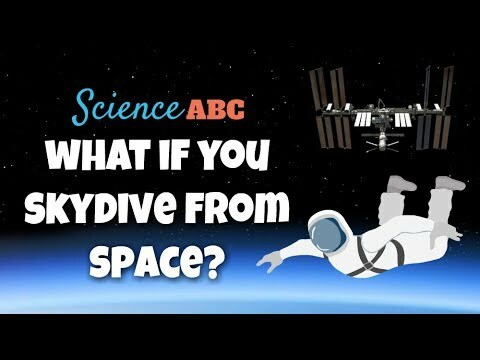 The ingenious yet highly simple mechanism of a beam balance is such that it can be used to measure mass regardless of its position in space. However, the mass depicted by a beam balance is still not objective. 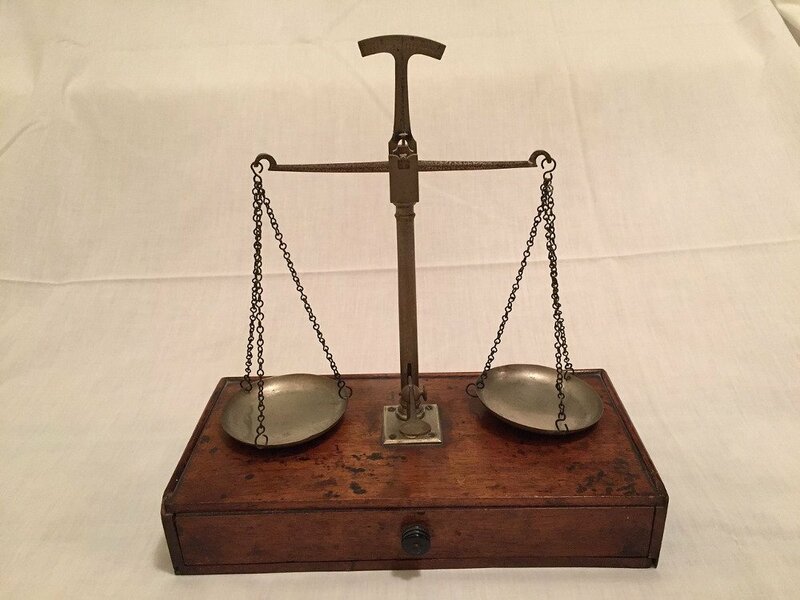 In a sense, one can conclude that, akin to a weighing scale, a beam balance finds an unknown mass only by comparing it to a known one — it is calibrated to a fixed known mass. 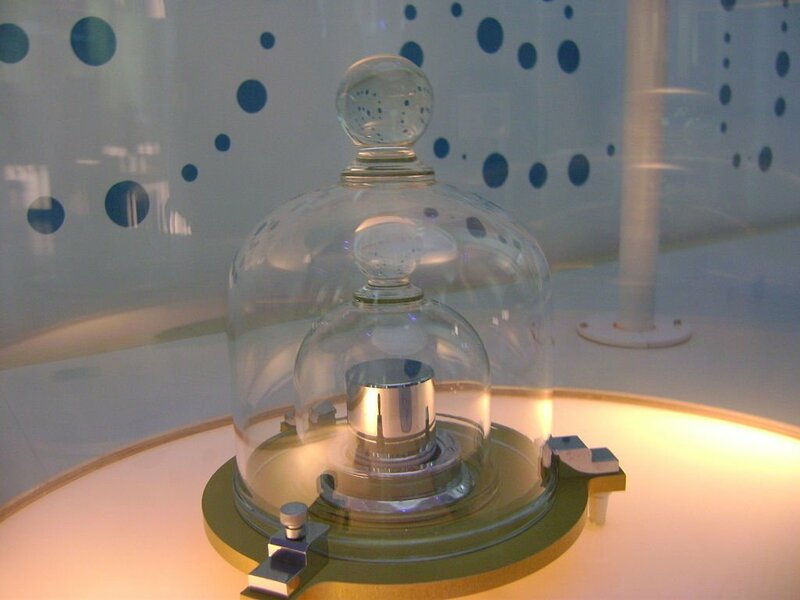 In fact, the standard unit of mass, one Kilogram, corresponds to an object reposing in a highly secure vault in France. Several scientists have speculated on the possibility of certain new ways to define a kilogram and measure mass objectively. The most fascinating, although exceedingly challenging of these ideas is to count individual atoms that constitute the mass of a body and obtain an arithmetic sum of their masses! So, the next time you indulge in small talk and someone mutters “I weigh 90 pounds”, delight in your scientific knowledge, bring to your consciousness this newly gained lesson, take a deep breath, and with a tender smile, regardless of how condescending it might sound, correct them. After all, knowledge is the greatest gift a man can impart, and witness yourself being hurled out of the party. under heading How do we obtain mass from weight? in first sentence you say weighting scales are for mass measurement but as per your explanation given followed by that sentence looks some thing different. i think weighing scales for measurement of weight rather than mass of an object. The meaning might have been lost in improper articulation. If you read the next line, you realize that weighing machines measure mass by measuring normal forces and dividing them by the acceleration due to Earth’s gravity — g. The division is achieved by calibrating the device. If weighing machines were to measure weight, the dial would read a value in Newton, the SI unit of force, not Kilogram, the SI unit of mass.